Often associated with flashfloods, an arroyo is a stream bed or dry creek that temporarily fills and flows after sufficient rainfall. 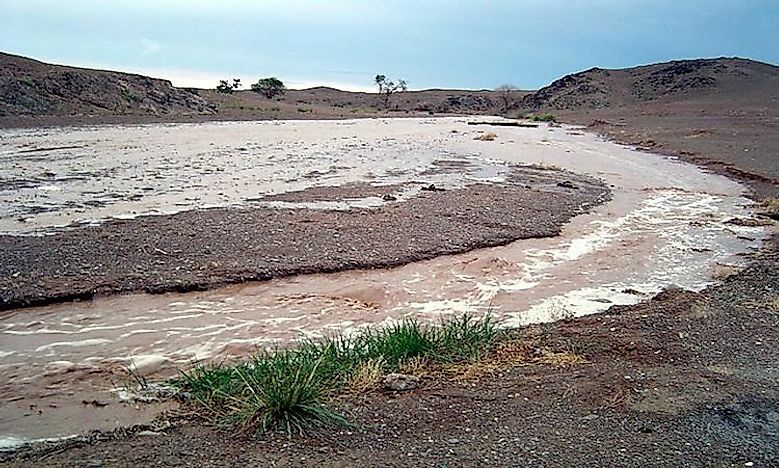 A flash flood hits a dry streambed in the Gobi Desert. Arroyo is a Spanish word for Brook and refers to a dry creek, a gulch, or a stream bed that momentarily and occasionally fills up and flows when there is a heavy downpour. Arroyos experience flashfloods when there are thunderstorms. An Arroyo in Latin America may refer to a stream or a small river that could be flowing constantly without drying up. In North America and parts of Southwest Asia the Arabic term Wadi or rambla is used instead of Arroyo. Arroyos are an important source of water in the desert regions. In the US, the desert dry wash biome covers the Arroyos of the southwestern part of the country. Arroyos could either be formed naturally through the fluvial landforms or it could be built as flood control channels. Arroyo landform typically refers to a mountainous or sloped landscape in a desert climate or a xeric environment. Sometimes the Arroyo may have a vertical walls cutting through the desert with a gravel bottom floor between the walls. In many rural communities, the arroyos serve as the primary transportation routes, while in the urban settings they could serve as recreational parks that could be used for biking, used by pedestrians or could serve as equestrian courses. Flash floods can cause some deep arroyos or deposit sediments on the flooded lands. Such floods can lower the level of groundwater in the surrounding area and therefore making the place not suitable for agricultural practices. However, when the water table in a desert is lowered as in the case of an arroyo, it can lower the salinity that seeps and the alkalinity that is deposited on the top soil and as such making the area not suitable for agricultural activities such as farming. The natural occurring arroyos are made through the natural process of arroyo cutting which takes place in dry and arid place like a desert such as in New Mexico. The heavy rains may enlarge the rivers cutting down the rocks and create ravines which are always dry during ordinary weather conditions. The arroyo cutting that took place in the Southwest of US in the 1900s led to adverse and severe effects on farming because it resulted in lower water table thus affecting agriculture and grazing in the region. Natural arroyos are found in different parts of the world for instance in Gobi Desert in Mongolia and San Lorenzo Canyon in the US. In India, some rivers flow with water during monsoon season and dry up later forming arroyos on the surface. Arroyos are not only limited to lowlands, but are also found in the mountain regions. Arroyos could also be constructed in different parts to control flooding during heavy rainfall in urban dwelling in the dessert areas. In farming, arroyos could be utilized to control the flow of water into the fields and control flooding during heavy rains. Traditionally, famers relied on small arroyos, aqueducts, and channels to distribute water for farming. Now large arroyos have been constructed such as in Alburquerque in New Mexico and in Rio Grande. In southern California Arroyo Seco and Los Angeles River, though they were initially natural arroyos, they have been constructed further as open drainage arroyos. A sudden heavy downpour in the desert especially a dry ground may not absorb water quickly and therefore flashfloods occurs. Such water flowing along arroyos will sweep and carry everything on their path. Flashfloods on natural or artificial arroyos may cause casualties and loss of lives. Often signs are posted to warn people of the danger.